In a landmark effort to better understand, explain and improve the landscape for Early Care and Education (ECE) in Los Angeles County, Advancement Project has released three reports and unveiled a new interactive website to benefit media, advocates and decision makers seeking to enhance and expand high-quality early learning opportunities. "Tools like these are essential to help policy makers understand the overall need for investment in early care and education, and the significant access gaps confronting families across L.A. County," said First 5 LA Policy Director Peter Barth. The online data tool, available in an easy-to-use website, allows visitors to use an interactive mapping tool that displays access-related information for ECE in L.A. County by zip code, city, school district, legislative district and congressional district. There are nearly 650,000 children ages 0–5 in L.A. County, according to the 2011 American Community Survey. The ZIP code of L.A. County’s youngest children from birth to 5 frequently predetermines their early education opportunities, and lower-income children often find themselves with few options available. The ECE landscape in L.A. County is a vast system that has endured significant funding cuts since 2008 and throughout the Great Recession. When looking at the ECE landscape, the future of these at-risk children is at stake if there is not a systematic attempt to address gaps in access, quality and workforce supports. The Early Care and Education Landscape in Los Angeles County: Access, Workforce and Quality – which describes the state of ECE in Los Angeles County around three major areas of inquiry: Access, Workforce, and Quality. Past Roles and Strategies of First 5 LA and Other Funders – which examines the past roles and strategies of First 5 LA, other First 5 county commissions, and other ECE funders to better understand the funding and investment strategy landscape that has shaped or could help influence LA County ECE work. Opportunities and Considerations for Addressing ECE Gaps in Los Angeles County – which is a culmination of the prior reports and discusses potential future roles and strategies for First 5 LA and other ECE Funders in Los Angeles County. The three reports and the online data presented are compiled from existing secondary data and reporting, analyzed by Advancement Project staff and researchers, and augmented by interviews with key stakeholders. 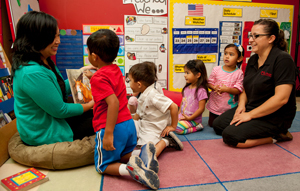 Access to ECE in Los Angeles County appeared limited, particularly for infants and toddlers. There were only enough seats in licensed ECE centers for 2.4 percent of infants and toddlers and 41.3 percent of preschool-aged children. Access to ECE varied greatly within the county and hot spots of need continued to persist. Areas in high need of ECE services tended to have more low-income families and more Hispanic or Latino and/or African American children. There were two distinct professional development pathways for groups of Angelenos working within ECE: (1) “traditional” high-school and college-educated ECE providers with more linear career trajectories and (2) nontraditional providers less comfortable with and less commonly found in formal education settings. For many in this second group, their challenge was accessing traditional formal education pathways to increase their education levels and remain working in the ECE field. There is anxiety among providers that increased requirements for better qualifications, while desired, may “push out” some groups, such as older workers, non-English speakers, and people of color. Less than one-tenth of all centers and about 2 percent of all family child care homes in Los Angeles County were participating in and had received a rating from one of three Quality Rating and Improvement System (QRIS) efforts in the county at the time of data receipt for this report. Fewer providers serving infants and toddlers participated in Los Angeles County’s QRIS efforts compared to providers serving preschool-aged children. “This report outlines how difficult it is for families to access quality early care and education in L.A. County and highlights the need for our government decision makers to prioritize the development of a strong and sustainable early learning system," Barth said.